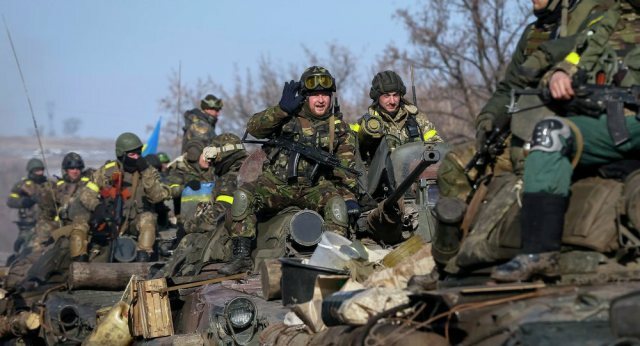 The ceasefire between Kiev forces and independence supporters of Donetsk and Luhansk is generally holding, shelling in Donbas has stopped as the truce came in force on midnight, a spokesperson at the Kiev special operations headquarters said Sunday. But a day earlier Ukrainian President Petro Poroshenko and US President Barack Obama, during a meeting by phone, agreed on the further coordination of efforts in the case that the ceasefire fails and the Ukrainian conflict escalates. Stephen Lendman, a Research Associate for the Centre for Research on Globalization explained to Sputnik, in an exclusive interview on the recent developments in Ukraine, that Washington has been lying the whole time – it has been supplying weapons to Kiev from the very start of the military operation. “Washington supplied heavy weapons since the conflict began last April and maybe before it began in preparation for what was planned. I wrote about it several times including in a new article this (Saturday) morning,” he told Sputnik. “So, key is understanding that Washington armed Kiev the whole time. Obama claiming it’s under consideration is one of his many ‘Big Lies’,” he said. NATO and Ukrainian aircraft have shipped in arms and munitions on a regular basis. Washington is the main culprit, he added. “US media, of course, blame Russia and rebels. Reports and opinions in our press are scandalous. The most outrageous I recall in my lifetime. Absolutely devoid of truth. Riddled with beginning-to-end Big Lies,” Lendman said. “I expect a short-term mostly (but not entirely) quieter period beginning Sunday or Monday followed days or weeks later by Kiev initiated escalated conflict — with full US support and encouragement,” he predicts. “Hardline Kiev elements like the Right Sector’s Dmitry Yarosh and likeminded extremists reject Minsk terms. They vow to keep fighting. Expect Russia and rebels to be blamed for their aggression. Expect vicious Putin bashing to continue. It’s evident in US weekend reports I’ve seen so far,” he added. The political analyst predicts that Washington will continue supplying Kiev with heavy weapons. Hundreds of US combat troops are coming to Ukraine on the pretext of training Ukraine’s military, while hundreds of US special forces are already there. The big question is whether Obama will authorize direct US involvement in Ukraine’s conflict. He’s already done it in Iraq with US boots on the ground and more on the way despite vowing months earlier never to do it. “I believe if rebels keep decisively defeating Kiev forces, which I expect, Obama will deploy US forces to Donbas — getting America directly involved in another war as opposed to the proxy one he’s now waging,” said Lendman. An escalation will bring the war to Russia’s borders, and the risk is it may spill over. With US combat forces in Ukraine and Obama determined to crush pro-independence fighters, the danger of East-West confrontation is huge. “We could find ourselves in WW III whether or not anyone wants it. Global wars begin like what’s now ongoing. With neocon lunatics making policy in Washington, anything ahead is possible,” he added. President Putin, Sergei Lavrov, and other Russian officials have gone all-out for peace throughout months of conflict. “Obama wants war, not peace. Donbas is his war. He didn’t launch it to quit. CIA, FBI and US special forces infest Kiev. They’re involved in planning, implementing and directing the fighting,” said the analyst.